I’ve been wanting to try Kiriko Sushi for some time, but as with the Lazy Ox Canteen, it took Dine LA to get me to go. I love neighborhood family run places which feature fresh ingredients and serve them with skill. It was a pleasure to dine here with a packed house of regulars who were all greeted by the chef personally. The three course Dine LA menu for lunch was $25 for three courses and I chose the albacore sashimi with garlic ponzu sauce and organic greens as my first course. It was delectable. The fish was complimented, not drowned by the ponzu and the tasty salad had a nice savory dressing. For my second course I chose the “Temaki” hand rolls of spicy tuna, spicy yellowtail, blue crab, and eel & avocado rolls. They were all good, but nothing outstanding. I found there was too much mayonnaise in the blue crab roll (why add mayonnaise to blue crab?) and too much sauce in the eel & avocado roll, but I think most diners would like the rolls. I was impressed that for the price they used real blue crab and the quantity of fish to rice was about 50/50. I was also impressed that they make their own ginger and didn’t use a prepared ginger, however I was not impressed with the fact that they did not offer a hand towel before serving me hand rolls. The dessert of Meyer lemon sorbet was a perfect ending to this very nice meal. 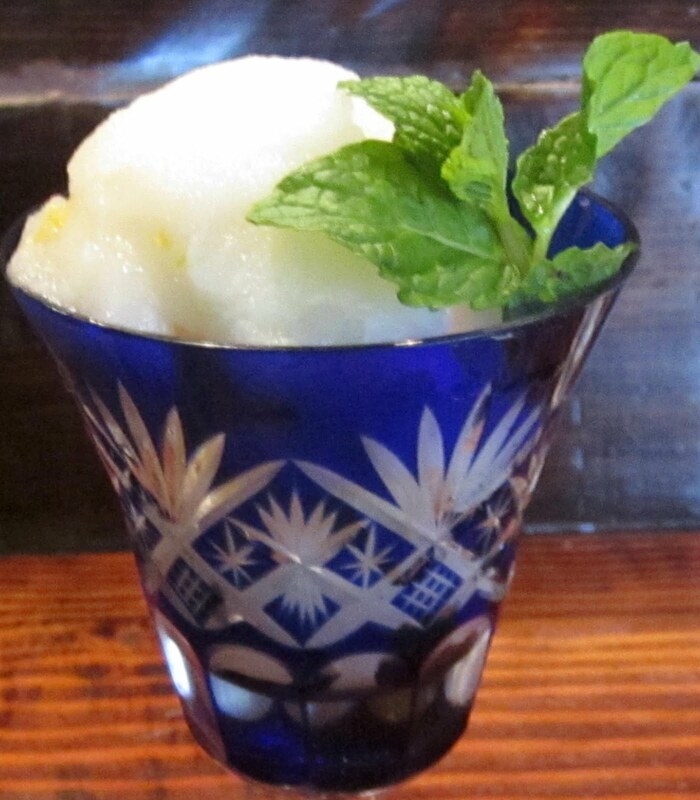 There were strips of lemon zest in the sorbet and the shiso leaf added a nice minty zing of aroma. Sometimes it takes Dine LA to get me to finally go try a place my friends have been raving about for years. Nearly every food lover I know in Los Angeles has been trying to get me to Lazy Ox Canteen and I am very happy to report that not only did I finally go, but I loved it 🙂 It’s always nice when expectations of good things are met by good things! 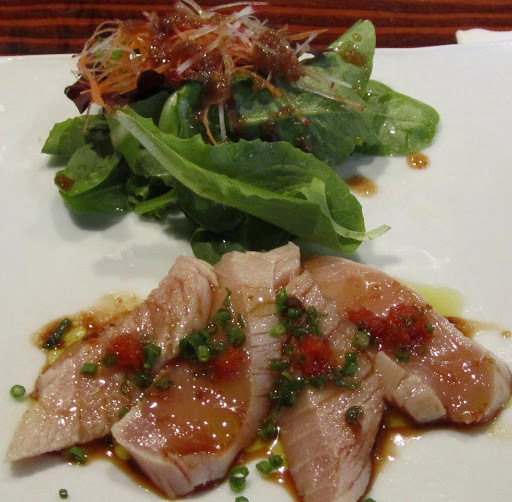 Dine LA has a special $20 three course lunch here that is well worth the sojourn to Little Tokyo downtown. Since my chosen entree alone would have been $20 on the regular menu, I opted for the special even though I am not a big dessert eater, I figured my friend could eat my dessert along with hers (she did). It was a challenge to decide which of the starters to order, so we each got one of the vegetables so we could taste both. 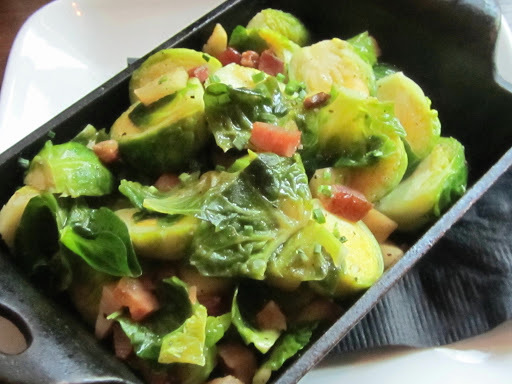 She ordered the roasted Brussels sprouts with bacon, apple and lemon. After one taste, she said “This is how my Mom used to make it”! It had a wonderful smoky roasted bacon flavor without being greasy and will surely convert non Brussels sprouts lovers (especially those who love bacon). 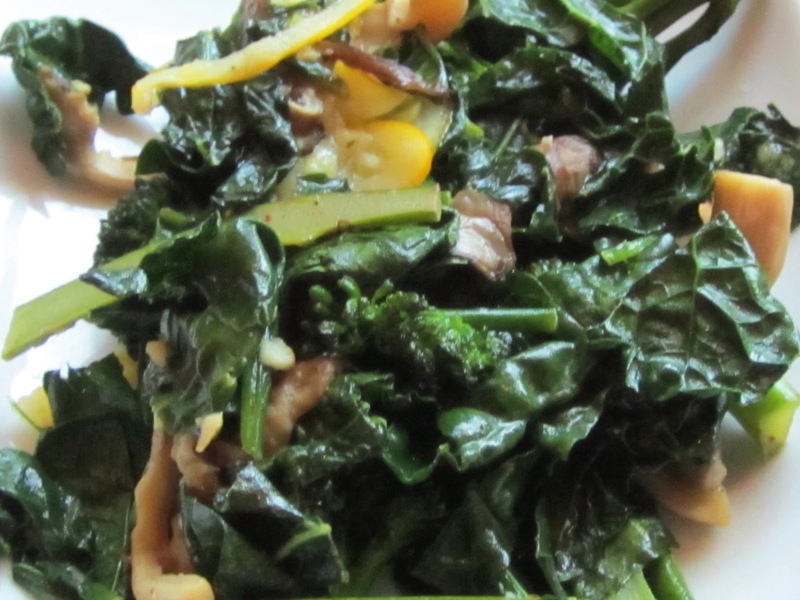 I ordered the bowl of greens with Tuscan kale, spinach and baby broccoli. The oyster mushrooms and preserved lemon in the dish added a depth of flavor and varying texture that made this dish remarkable. I will definitely reorder this dish the next time I come here. 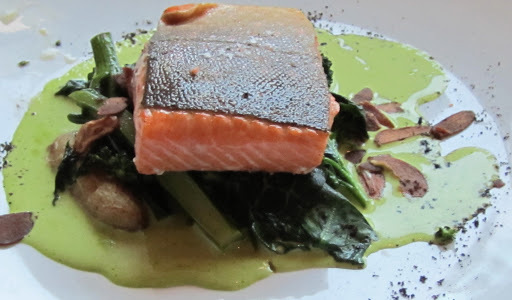 I ordered the Artic Char with garlic chips, buerre blanc, rapini and a fingerling potato. The fish was done very well, i.e., not over nor under cooked, but it wasn’t spectacular like the fish I recently had at Church & State. The rich sauce was just a bit too heavy without adding enough ommph to the fish, though I loved the garlic chips and the rapini. 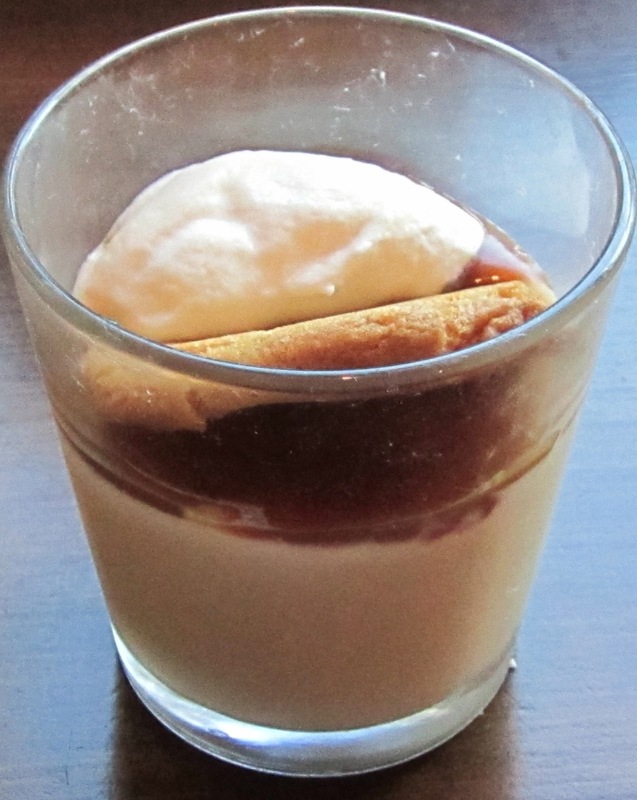 The butterscotch pudding with peanut butter cookie was light enough for those who want a creamy dessert but don’t have the room for a heavy sweet at the end of a meal. I tasted both the pudding & the cookie and if I were chose a dessert, I would choose this one. The rice pudding with caramel and pinenut crumb was much more filling and much richer in texture and taste. If you are a fan of rice pudding or want something denser at the end of your repast, this would be the dessert for you. Considering the plethora of places I have yet to try in Los Angeles (not to mention the world:), I’m glad to have checked out the Lazy Ox and found my expectations for inventive well executed food met with expertise. The Lazy Ox may be a bit out of the way, but once you taste their food, you won’t be lazy about coming to eat here. The most wonderful time of the year here in Los Angeles (to me) is when it’s time to Dine LA. Beginning this Monday January 21- February 1, 2013, restaurants, shops, and hotels will feature deals for those who want to sample different places or go back to places they love. This year many places will no longer have a week-end “blackout” and will offer their specials throughout the 12 day event. Prix Fixe menus at many of my perennial favorites like Tavern, Bouchon, and Chaya Venice, will have me going back for 3 courses at lunch ($25) or dinner ($45) which will showcase their wonderful food for a fraction of their regular prices. New favorites like Coupa and Next Door, offer 2 courses for lunch at only $15!!!!! It’s also the time to try new places (for me) like Brick + Mortar, Muddy Leek, and Lazy Ox, so the next two weeks will be filled with two of my favorite things; great food and great prices! I have traveled to 17 countries, but not to Venezuela…yet. 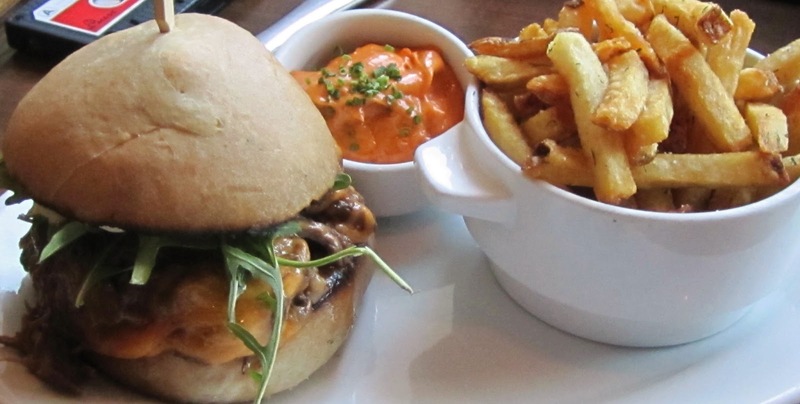 It looks like it’s time to put it on my itinerary after eating at Coupa Café. Since January 7-13 is “Around the World in Beverly Hills” Restaurant Week, it’s an ideal time to travel with your palate, without depleting your pocketbook. I was invited to try Venezuelan food by the PR company which represents Coupa Café and I was intrigued enough to venture out to “exotic” Beverly Hills to this beautifully appointed and easily accessible home away from home for many South American expats. One of the tell tale signs that a restaurant is serving authentic cuisine is that expats eat there. Another tell tale sign is that the restaurant actually has a branch in their home country, and Coupa Café has a branch in Caracas! And the third sign of authentic cuisine is when they source their ingredients from natives; the cheese that they use in the restaurant is flown in from Miami where it is made by Venezuelans! Since I was invited, my meal was fully comped, and they knew that I would be writing this post. Having worked in the industry and written many reviews, I know when good service and food are consistent and when they are not. It is definitely consistent here as I watched the reactions from other diners who were equally happy with their meals (if anything changes on a subsequent visit, it will be noted here). 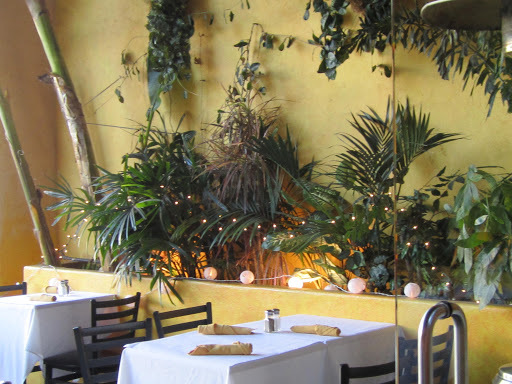 The outdoor patio is a wonderful place to eat if the weather in Los Angeles is as balmy as it usually is, even in the winter. I sat inside the lovely recently redecorated café. 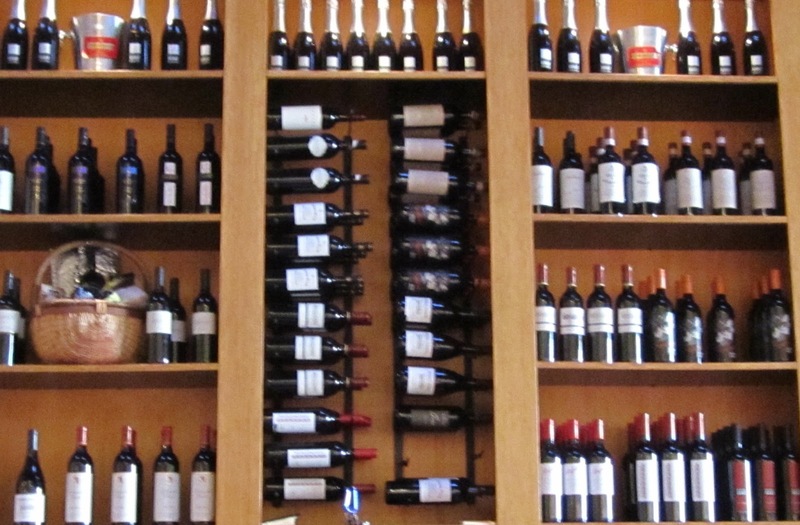 With a view of the wine bottles. 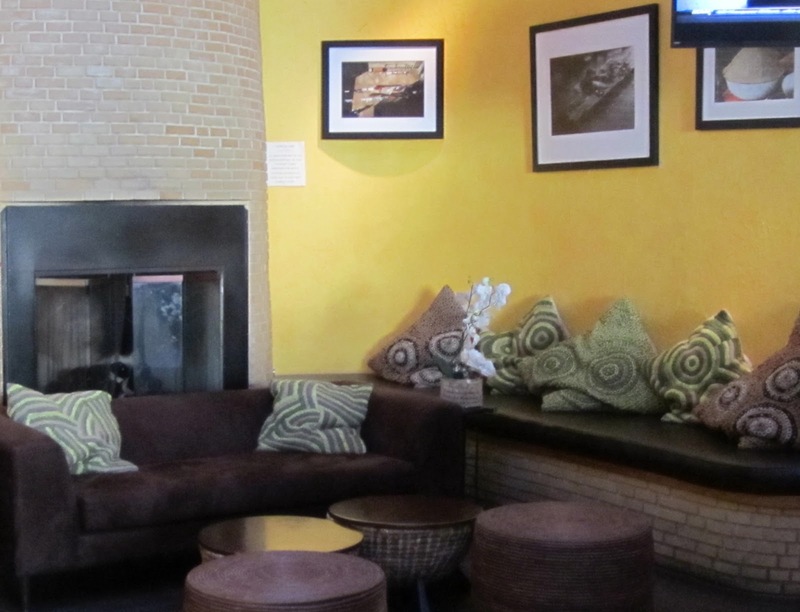 And a nice seating area with a fireplace. 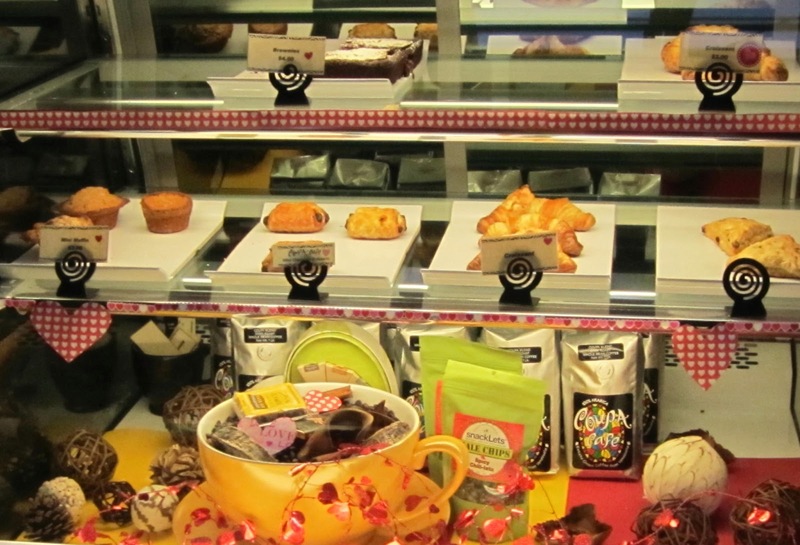 The interior also had beautiful fresh flowers and a tempting pastry case with goodies to go. 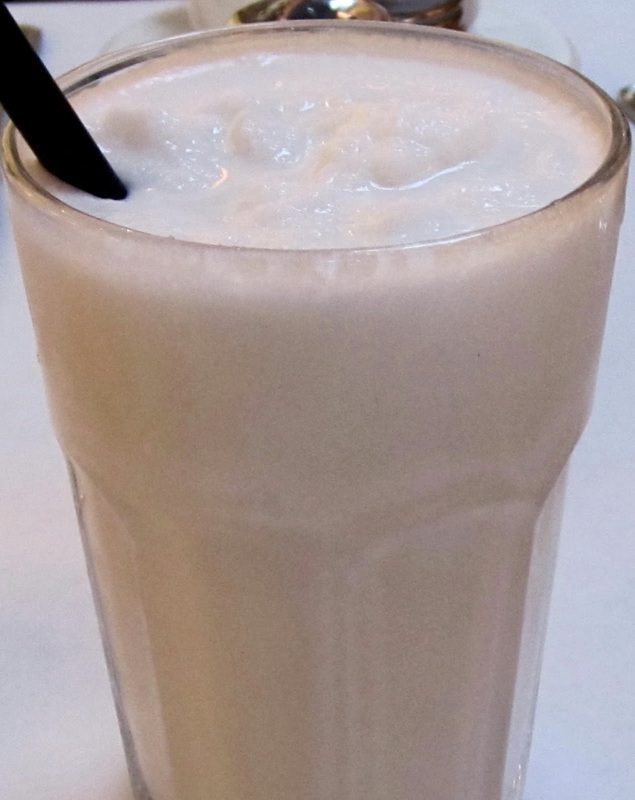 One of the specials for this week is a traditional Venezuelan coconut milkshake called a Cocada for $4 that was the perfect tropical accompaniment to my meal. It is made with coconut water, so it it not as rich as a creamy milkshake, but perfect for those of us who love coconut water and freshly grated coconut. My next course was another appetizer, or pasapalos, the mini cachapas, also $7. These were mini corn griddle cakes with de mano cheese and served with a fresh sour cream called nata. I am not someone who loves sweet dishes, but the sweet corn in this dish was outstanding. 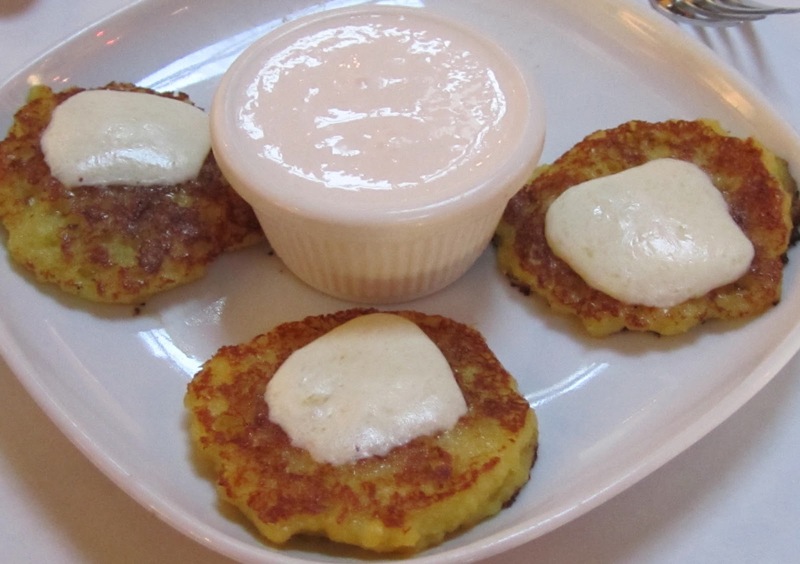 I wanted to give the griddle cakes a standing ovation for the subtle fresh corn flavor, the caramelized crunchy sweetness on the bottom, and the wonderful combination of cheese and fresh sour cream that made this a dish you could eat as an appetizer, side dish or even dessert. You can tell how much I liked this dish because it came with four pieces, but I ate one before I realized I had not yet taken a photo! 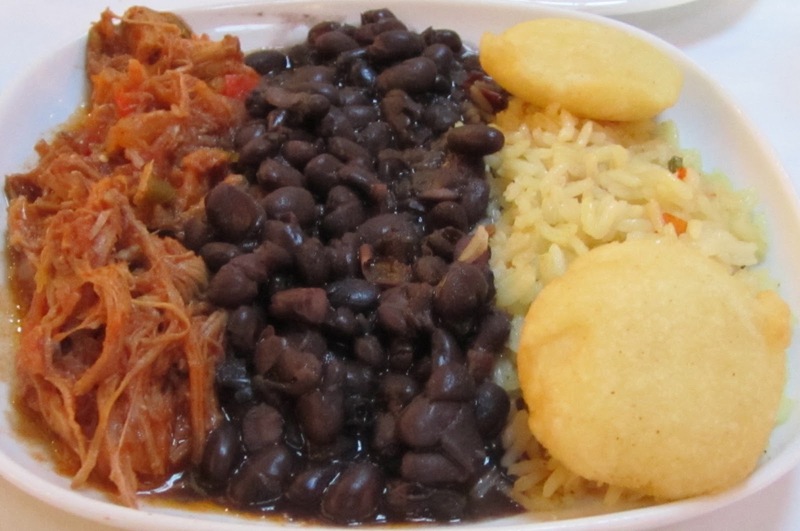 My main course was the Pabellón with carne mechada, black beans, rice, and arepitas $19. I have never eaten the nationally known dish of carne mechada before, but now I believe that I am addicted to it! The flavors of the peppers, onions, and tomato are infused in the shredded beef and offer such an aromatic enhancement that you may wonder how you ever settled for any other kind of shredded beef. Because the flavor of the beef is vegetable based, the beef does not taste heavy like a braised short rib, so you can eat this as easily in the summer as the winter months. The rice was fabulously done with a vegetable stock that sang out “eat me”, and the beans were a good starch without much spice for those who prefer their beans plain. The arepitas are a crunchy fried cornmeal accompaniment which some people will adore and others will find bland, but like the beans, it will all depend on your preference. 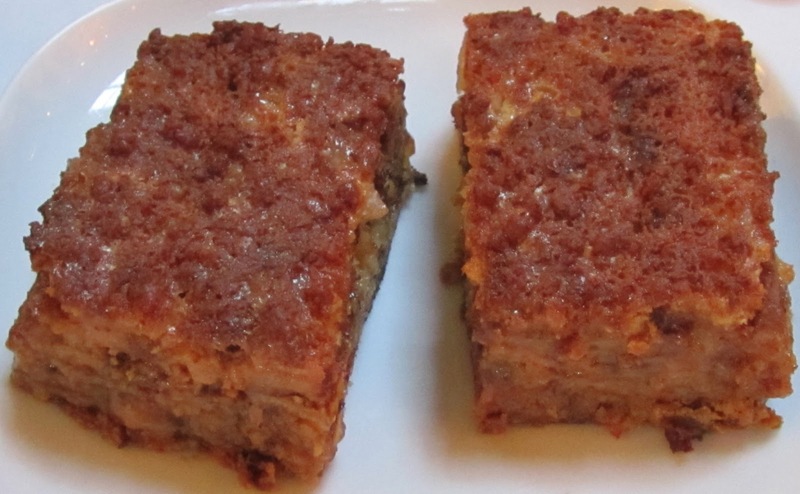 The specialty appetizer I was invited to try was the torta de platano, a traditional sweet fried plantain dish, layered with white cheese and papelon, a raw hardened sugar cane pulp, for $8. It tasted more like a great dessert to me, especially if you love bananas or plantains and sugar. It was very rich and quite sweet, but not tooth achingly sweet. I ate about a third of one of these pieces and was completely satiated. If you have a sweet tooth you might be able to finish one piece (half an order). Nicky promised me that the last thing I had to taste was the Mayan hot chocolate. I was happy to see it came in an small espresso cup after my many courses. After one sip, I was enthralled to discover that the flavor was spicy, warm, and chocolaty. 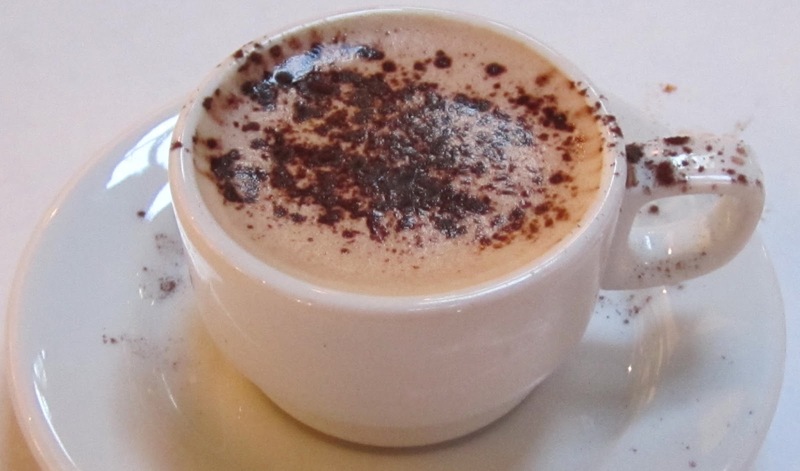 They also make a mocha version, and since they are famous for their coffees, the next time I come, I will be ordering that variation. Thanks to Lisa and Mila from PMBC Group for the invitation, thanks to Nicky for your wonderful service, and thank-you Camelia Coupal for creating such a wonderful space with delectable dishes to introduce those of us who live in Southern California to Venezuelan cuisine. Since it is a new year, I wanted to start it with a new place, and originally the plan was to try Public School 310, but since it was an hour’s wait for this hot new gastropub, I settled for a place that was new for me, Novecento. 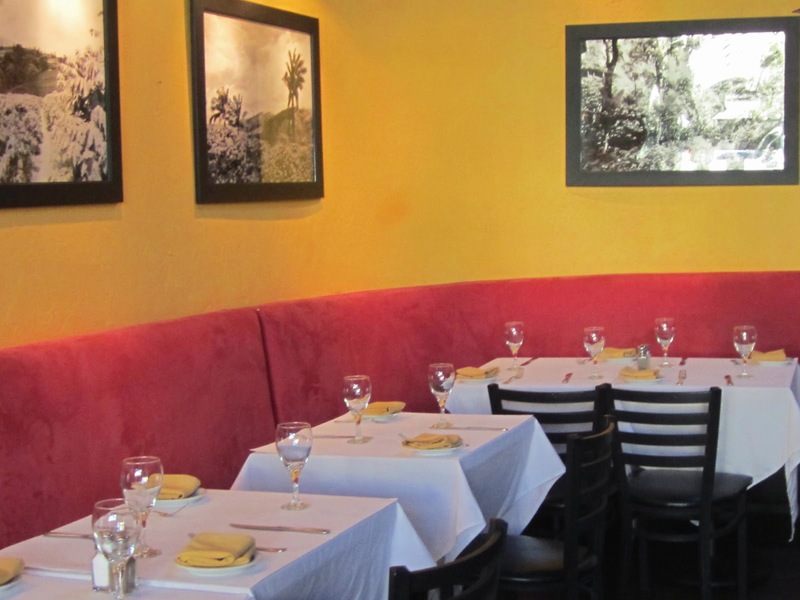 Located literally on Main Street, it has been in business for nearly 20 years serving home made pastas in a cozy space. Friends who are both picky and vegetarian have liked the food so I figured it could be a good place to start off a new year’s blog posts. 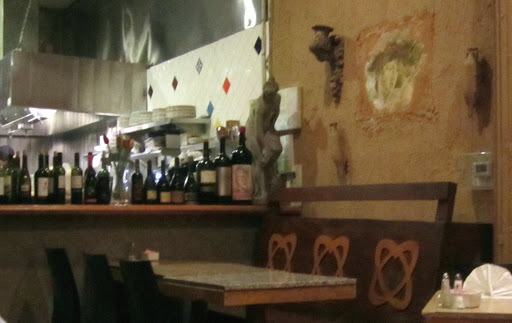 The space is warm and rustic with stone walls. The open kitchen and wine selection give the place a pleasant casual feel. Service was friendly and a tapenade was immediately offered along with drinks. 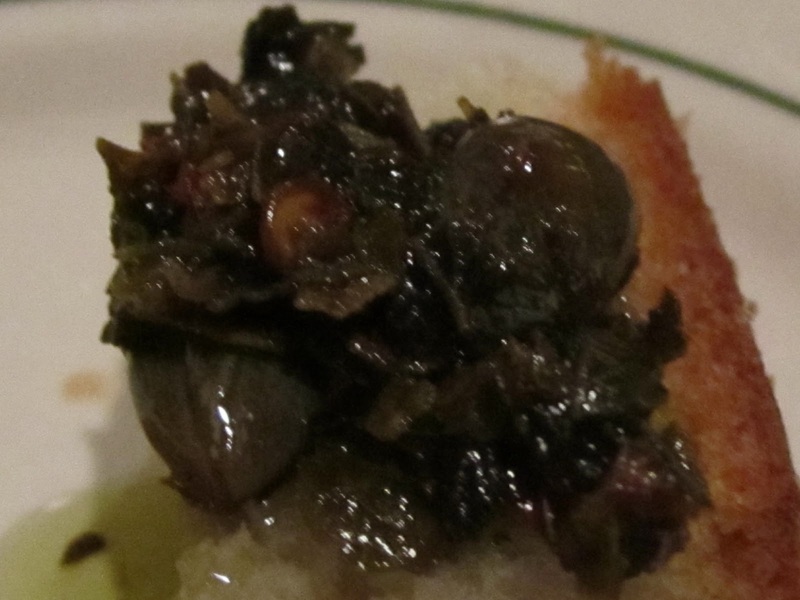 The tapenade had a distinctly spicy and lemony taste which was pleasant, but a bit unusual. 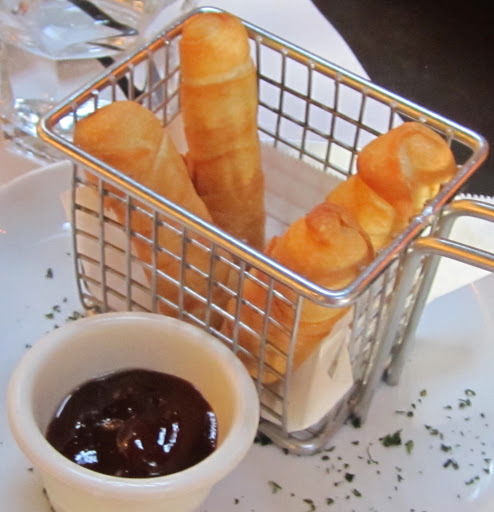 Once we placed our orders, a plate of sliced bread with a caper, herb, and red pepper dipping sauce was offered. 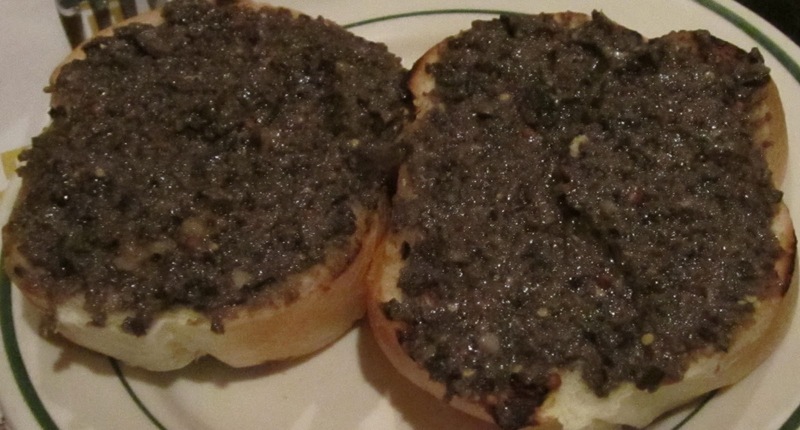 Like the tapenade, it had an unusual flavor, in this case, I found it somewhat unpleasant, as if the herbs had been sitting in the olive oil too long. 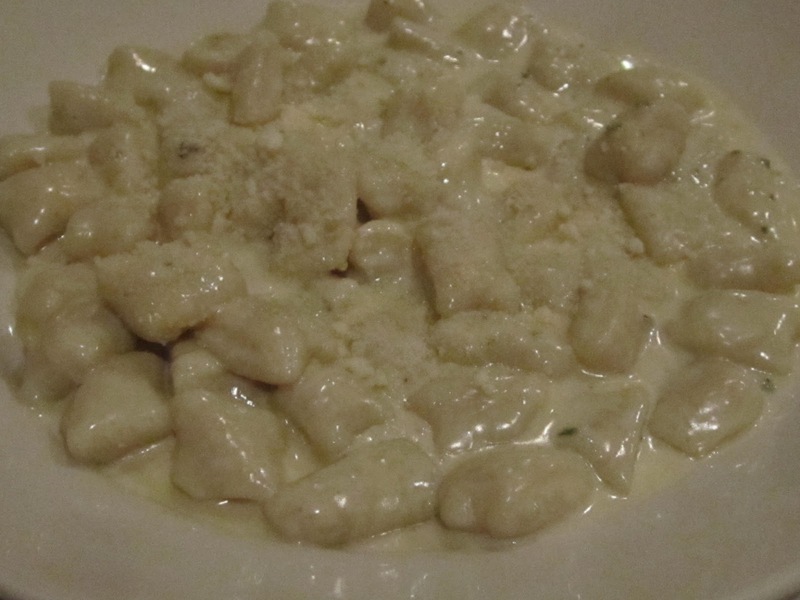 My friend ordered her favorite dish here, the gnocchi with a creamy Gorgonzola sauce. I had a taste, and it was indeed wonderfully made, with rich blue cheese and light gnocchi. This is definitely a dish that will stick to your ribs and throw you off your diet, especially if you add grated Parmesan to it (which my friend did)! 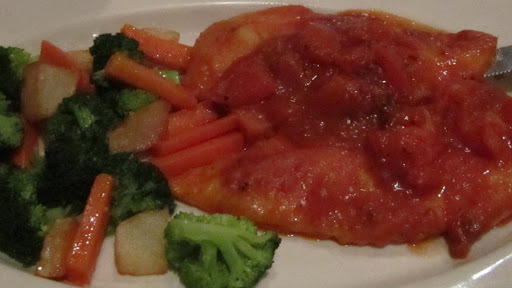 I opted for a lighter dish, the Pollo Arrabbiata, chicken breasts with a spicy tomato sauce and a side of vegetables. The chicken breasts were cooked properly, and the vegetables were decent, but the arrabiata (literally “angry sauce”) was completely bland and the tomatoes tasted canned. It was a disappointing plate when so many places do excellent renditions of this kind of food. Eating this here made me want to go to Il Grano or Campagnola to replace the food on my plate with better quality and better talent. My friend wanted dessert, so she ordered the blueberry creme brulee and thought it had good blueberry flavor (the dark spots on the photo are actually blueberries). 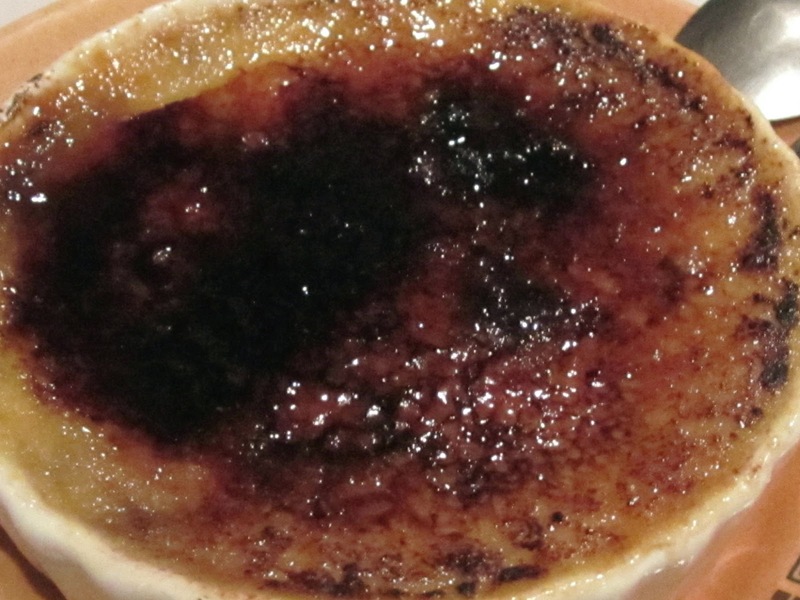 I thought it was not rich enough to be called a creme brulee, but a good version nonetheless. It is sad when an experience does not live up to your expectations, but thankfully it was a pleasant experience overall. The service was professional, the atmosphere was relaxed, and the bill for 2 entrees with a glass of DOCG Chianti, a soft drink, and a dessert was only $60 including tax and a 20% gratuity. It could have been much better, but it could also have been much worse, so I am grateful this experience fell somewhere in between.